Big news this week… We went ahead and locked in our mortgage interest rate. My husband called the lender on Wednesday, and we’ve since faxed back the agreement. We’re locking in our 30 year fixed rate mortgage at a 5% interest rate with a 1.017% origination fee. To be honest, I’ve been anxiously watching our lender’s site and counting the days until our closing date. I was worried that mortgage rates would go up before we locked. Fortunately, they didn’t, so we have one less thing to stress over about. A rate lock is an agreement with your lender to fix your interest for a limited time period. Locking in your rate keeps the terms of your agreement consistent prior to close. Your lender won’t increase your interest rate for a limited period of time, though they also won’t decrease it if rates fall. While I’ve read that some lenders charge a fee locking your rate, we found that pretty much everyone offered to lock our rate for free. If your lender tries to charge a fee, ask if they’ll waive it. And, as always, the terms of your should get the terms of your agreement in writing. Interest rates change constantly, so it’s possible that the rate you were first quoted will rise (or fall) between prior to closing. If rates increase and you haven’t locked, your mortgage payment will increase — perhaps to the point where you can no longer afford the payments. On the flip side, you may have to settle for the locked rate even if the interest rates go down. 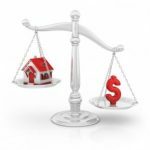 Be aware, though, that some lenders offer the option to “float down” your rate if it drops significantly. In our case, our lender will split the difference if the interest rate drops to 4.5% or lower prior to closing. 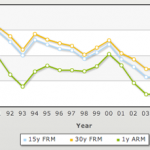 When should you lock your interest rate? There’s no concrete answer to this question. If you think that interest rates will rise in the near future, you should lock your rate. In our case, the interest rate was 5.25% when we first applied for our mortgage. It then went up a bit in the summer, but it’s now down to 5% for our FHA loan. In 2008, the average rate was 6.1% for a 30-year fixed rate mortgage. Since no one can predict the future, you’ll have to weigh your options carefully before you decide. You can compare current mortgage rates here. Personally, I can’t wait for this whole process to be over. I’ve never read so many forms and studied so many educational guides before. Did you feel like this as you were going through the home buying process? Do you have a rate-locking stories to share? >> when youâ€™re doing it the mortgage feels like the Biggest Decision Ever. Correct. It is one of the biggest decisions ever if one does the math. I think I had closed my 30-year mortgage for about a month when I realized that the rates had gone down again by 1%. When I looked at the amortization schedule for my 30-year mortgage, I felt depressed. I was 44 on a brand-new 30-year mortgage. So I made the decision to pay the fees and get into a 15-year mortgage. What a great decision! 15 versus 30 is a no-brainer to me. I wasn’t charged a penny to lock the rate. They did it over the phone and within days I was signing the closing papers. I called them the day the rates touched 5% and started the refinance process that day, over the phone. I locked in about 2.5 weeks ago at 4.25% on a 15 year fixed. I was very happy to get it and I am closing on the 30th. It was a local bank that offered that rate and his closing costs were also some of the lowest I’ve seen. We just renegotiated our mortgage for another 5 years and left it floating 1 point above prime. We can lock it in any time, and we are looking at doing that. If so, you’ll find that it’s refundable if you close with them. If you don’t go through with the loan, you forfeit it. I wound up going with a mortgage broker, and I’m really happy I did. I did my loan shopping, but the big banks really weren’t giving me the customer service I wanted. I didn’t understand the process, it was my first time after all. The broker explained the process to me, the practice of floating the loan etc, and I gained a much better understanding of the process. The banks wouldn’t even send me a GFE. The broker gets a better rate, and the way he gets his fee is in the origination fees – which you pay anyway. He wound up locking us at 5%, but then rates shifted downward, and he was able to re-negotiate for 4.875%. I was able to beat the advertised rate at the bank by an eighth of a point, I didn’t have to deal with banks who didn’t want to talk to me, and I was able to close in 30 days. A friend of mine recently refinanced and he had a “45-day floating lock” thing. He basically got the lowest interest rate that happened to occur in that 45-day window. Not sure if that is common, or if he had to pay extra for that. It can turn into an obsession – there’s so much room for buyer’s remorse over 20 or 30 years, when you’re doing it the mortgage feels like the Biggest Decision Ever. We currently have a 4.5% – 15 year rate locked in and are set to close on November 6. We did a 45 day lock which didn’t affect the 15 year rate. If we had gone with a 30 year fixed rate, the 30 day lock would have been 5% and the 45 day lock would have been 5.125%. We locked in last week at 5% on our FHA refi as well. Our original rate was 5.875%, so we are excited to be saving a nice bit of cash. We refinanced back in April (started the process in January, it took forever!) Midway through February we told our mortgage broker to lock us in at 4.75%. A month later he started talking about how we would have to see what rates did and decide when we wanted to lock our rate. I found out that he hadn’t locked us in when I told him to, he had been working on so many applications that he had forgotten when I told him to lock us in and rates had gone up to 5% by then. Luckily he was an honorable person and he used broker fee that he would normally get to buy down the rate for us. He made no money off the deal, but I got my 4.75%. Since I had just told him verbally and not in writing to lock us in, he could have claimed that it never happened. That is why it is a good idea to put everything in writing. I agree, I’d lock things in sooner than later. There’s not much room for a downward movement on rates so you’re more likely looking at a climb instead of a drop. I’m going to forward this to some friend that are house shopping as we speak! Good decision, rates can only go up from here!